Larry Fechter sweats every detail. During his two-year long '69 Camaro restoration project, Larry once spent four hours restoring a brake line clip. "I read books and look at original features and research how the factory positioned, attached and finished brake clips," he explained. This 1969 Camaro Rally Sport Z/28 hardtop has Canadian documentation. It sits in Larry's immaculate home shop in Iola, Wis., nearing the end of a two-plus-years factory stock restoration. The wheels and tires are for restoration only. Larry says even he can't be correct all of the time. "Often a car came down the assembly line and, if the worker was short the needed part, he would grab what was around. Production systems were less scientific years ago." "I always say a restoration starts with research," Larry noted. "It doesn't start with you wrenching on stuff. My goal is to get back to factory original as much as I can. That's what I enjoy doing more than driving or showing the car." Larry researches how cars were actually built and how parts were finished. "The racing stripe in the trunk (on the upper trunk lip) was not taped off so there should be no defined edge there," Larry explained. "The stripe in the trunk lip basically has over spray that gives a frosted appearance to it." Larry says the Camaro rear racing stripe varied between cars with and without spoilers. "If you have a spoiler, your stripe would not go all the way down on the trunk lid — it would stop and then it would go on the spoiler and it would end at the bottom of the spoiler, but not on the bottom on the trunk lid." 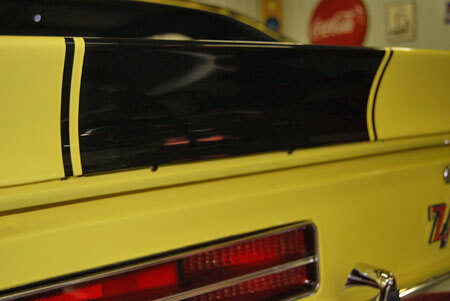 The stripe on the spoiler does not go all the way down on the trunk lid â€” it stops and then goes on the spoiler and ends at the bottom of the spoiler, but does not continue on the bottom portion of the trunk lid or on the rear panel. Larry's work on the rear of his car got into many other small "factory" details as well. His gas tank has a galvanized finish applied and black straps. "Some common mistakes are made when people do these gas tanks, he said. "The straps are supposed to be black. Another mistake is that a lot of guys will put a rubber pad under the straps and they didn't come from a factory that way." Larry says the Z/28 came with four leaf springs and three had a large, raised "dimple" on top. There is evidence that some cars might have had five-leaf springs, but for the most part it is four." The Z/28 springs have a unique flair to the end of each leaf. According to Larry, it's impossible to find new old stock springs and nearly impossible to find good used ones. "They do manufacture reproductions, but they are expensive," Larry warned. "Also, you have to make sure you're hunting for the right ones as they make incorrect replacements, too. The correct ones have a distinct dimple to them and that's that." This shows the right-hand rear spring mounting. T-bolts are used on the inside and a U-bolt is used on the outside. The acorn nuts are dimpled to keep them in place. Note staggered shock mounted ahead of axle on right-hand side of car. Z/28s came with so-called "spiral" shocks that are basically gray in color and very bland looking. They should have a specific sticker on them that indicates the correct shock. The sticker codes say PS on front shocks and UN on rear shocks. 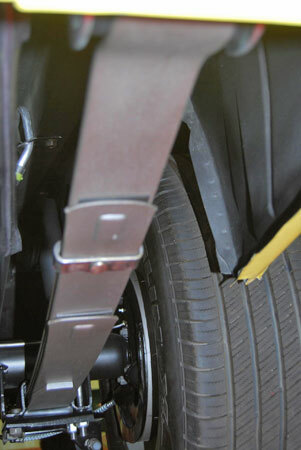 Chevy designed the shocks for staggered mounting. Short T-bolts are used on the inside. U-bolts are used on the outside. Both take specific acorn nuts that are dimpled so they will not vibrate off under hard driving conditions. 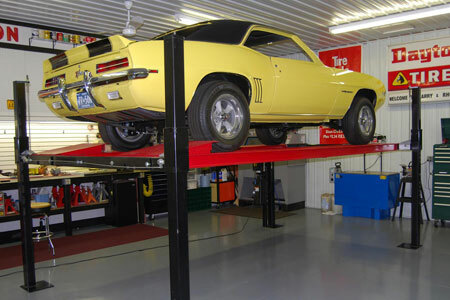 Spiral shocks like this rear right-hand unit were factory fitted on 1969 Camaro Z/28s. The shocks were painted gray have specific coded stickers. 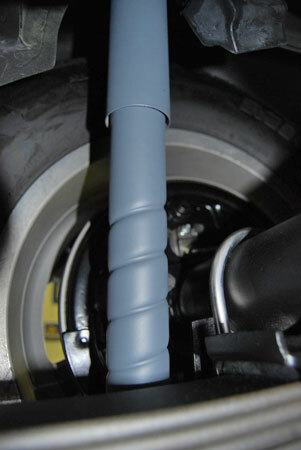 The correct code for front shocks is "PS" and the correct code for rear shocks is "UN." "Z/28 wheels are expensive," Larry said. "When they come up on eBay, especially a matched set with all the same date codes, you're looking at upwards of $1,500 to $2,000." The wheels were first painted all black and then they were repainted Rally Silver. There was over spray on some portions, but the back was black and the front was Rally Silver. Some restorers paint them all Rally Silver. The foot-operated emergency brake has a unique paint cut off between the black painted section and what was originally unfinished stamped metal. Larry coated this particular piece with Eastwood's Natural Metal finish that gives it a judging-acceptable original look, but keeps it from deteriorating again. The alternator for Z/28s had a special CZ marking that's unique. It has a deep-groove pulley. Z/28 exhaust manifolds are also unique. The distinctions include pollution devices, emissions hardware and holes along the top where the little injector tubes go in and get hooked to the Air Injection Reactor (A.I.R.) anti-pollution pump. The manifolds have specific casting numbers on them. 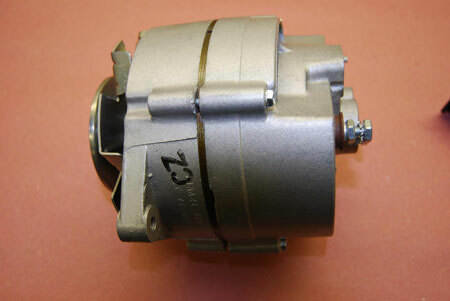 This basic type of alternator may have been used in many GM cars, but when it was used in a '69 Camaro Z/28 it was marked with a "CZ" code and fitted with a deep-groove pulley, Larry's restored alternator is an original Z/28 unit. Another part that Larry had restored to perfection was the jack, because the "hook" part is unique to 1969 Camaros. He pointed out that it has a 1969 "UN" number and the vertical tube of the jack has a "9G" code. "My understanding is that the 9 is the year and the G is for the seventh month July." The '69 Camaro Z/28 also came with a unique power brake booster that has the number 9204 on a very small tab on top. On the back of the same tab is a date of when the part was manufactured in the specific year. They did not stamp in an indication of the year, so a booster can date from late 1968 or 1969. Another unique thing about the Z/28 booster is that the Delco Moraine name is stamped upside down. "There are a lot of repros out there that people try to pass off as original looking," said Larry. "But the ones from the factory have the upside down name and I have not found a manufacturer who does repros that way." Larry's brake and clutch pedal have also been restored. "What I did there was to duplicate the cast iron or stamped metal and the pedal itself is the way it would have come from the factory," says Larry. "It is completely rebuilt and I paid real close attention to detail, so all clips and everything else are factory. There is a date code that basically tells you when it was manufactured." Other specially-coded parts are the transmission bell housing and Hurst Competition Plus shifter. The former is basically a Chevrolet small-block bell housing, but if it goes to a Z/28, the last four digits of the code stamped into it are "403." Larry has the 403 bell housing that originally came with the car. He also restored the same Hurst shifter mechanism that the car left the factory with. Like the rear racing stripes, the front ones were painted with some over spray settling in the areas under the cowl vents. 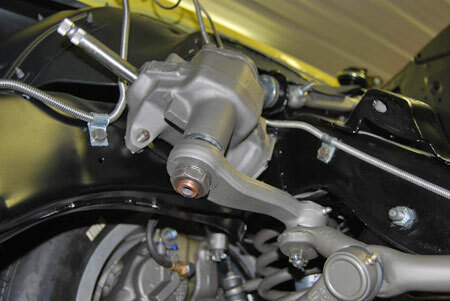 The front suspension has special parts like a Pitman arm that is longer on Z/28s. "A lot of people mistakenly think that the quick-ratio steering that was standard on the Z/28 was special in the gearbox," Larry pointed out. "It really wasn't; it had nothing to do with the gearbox. It had all to do with the added length of the Z/28 Pitman arm. The steering box and linkages also look new. The Z/28's quick-ratio steering had nothing to do with the gearbox. A standard manual gearbox was used and the added length of the Z/28 Pitman arm (which had a unique number) did the trick. All '69 Camaro Z/28s had front disc brakes and Larry pointed to the numbers stamped on the brake rotor shields. Naturally, he has the correct spiral shocks inside the correctly finished front coil springs. "The previous owner had already replaced the ball joints," Larry said. "But one of the boots had a cut in it, so I took the whole front suspension apart and used another ball joint with a perfect boot." When Larry put the front suspension back together, he used the correct size and style cotter pins and bent them the way the factory did. Larry says that he uses paint to restore some parts and powder coating on others. "The products I use work hand in hand and look the same," he explained. "Powder coating is more durable, however because it eliminates nicking. I have learned tricks over the years and there's a time and place for both types of refinishing products. Larry does his own powder coating using an Eastwood gun and infrared lamps. He does some small parts painting, but sends most paintwork out to a local shop. He prefers Martin-Senour paints. Larry likes to do things right the first time. "My hobby is actually taking the time to take things apart, research them and put them back together," says Larry. "When I'm done with this type of restoration, give me a different one to do." Larry has been asked to do work for other people, but doesn't. "I take my time and enjoy my hobby," he said. "I don't have customers asking 'Where's my car.'"